The left hand part starting from bar 3 to bar 6 is the tonal answer of the fugue subject. This fugue subject is famous for using all twelve pitches of the chromatic scale, though the C-natural is missing in the tonal answer version of the subject. 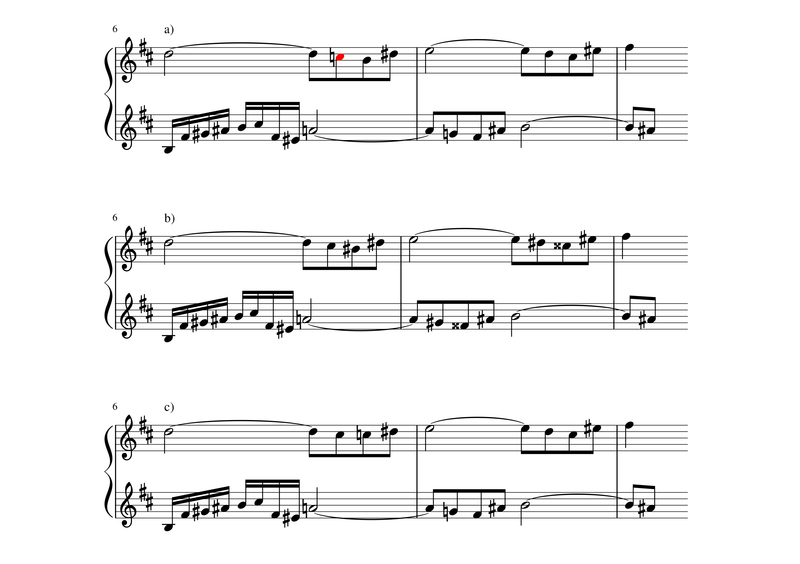 That C-natural seems to be put back into the picture by the countersubject in the right hand in bar 3, highlighted in red, but it is also the first of several instances in this fugue where one might feel puzzled about the direction to which the music leads. The reason is two-fold. Firstly, there isn’t a straightforward way to explain the dissonance between the highlighted C-natural and the minor 9th it forms with the B in the bass; it is not a passing note, nor an escape note. The best explanation I can come up with is that it is as an anticipation to an implied diminished 7th harmony on the fourth beat, as shown below. Secondly, the answer starts in the dominant (F-sharp minor), with the F-sharp minor key established as a new tonic by the first two beats of bar 3. The appearance of the C-natural in the third beat drastically undermines the stability of the tonic triad, because by lowering the C-sharp to C-natural, the F-sharp minor harmony loses its perfect 5th and becomes a diminished triad, and hence also losing its function as a tonic. In and of itself, it is common to undermine a newly established tonic to facilitate quick modulations, but that is usually done by lowering the leading note, as can be seen from bars 41-43 in Ex. 3. In comparison to the standard practice of lowering the leading note, the lowering of the dominant is akin to opening Pandora’s Box. Perhaps both problems are results of a structural feature of the subject, as it is one that modulates to the dominant. If the subject modulates from I-V and the answer, in an unaltered version, modulates from V-II, the sense of the overall tonic of B minor will be lost. Therefore alterations had to be made to the answer to maintain the integrity of B minor, though in an imaginary scenario, an answer that modulates from IV-I would probably sound smoother. Ex. 5a is Bach’s version; 5b averts the C-natural, using its enharmonic B-sharp as the leading note to C-sharp minor, though the resulting figures are less sumptuous than Bach’s version; 5c makes less alterations than 5b, but would be grammatically incorrect. Ex.6 below is an even more emphatic case of the lowered dominant as it comes right after a strong perfect cadence into F-sharp minor, followed by an almost identical figure from Ex.5. Another way to understand the extraordinary nature of the lowered dominant is to consider its function. 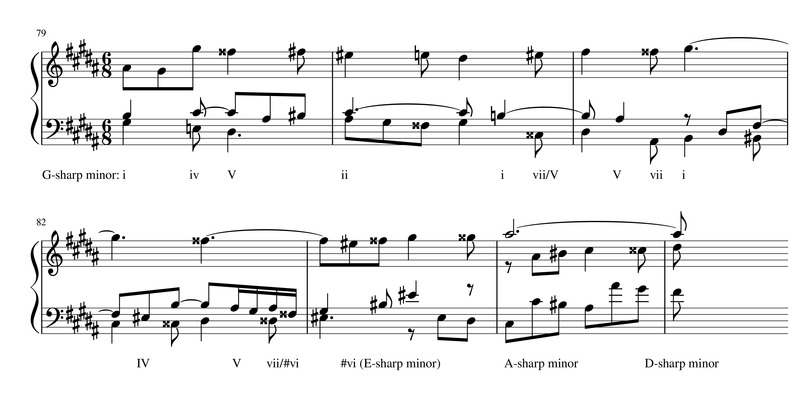 As seen in Example 6, the scale at the start of bar 24 (F-sharp, G, A, B, C) outlines the F-sharp diminished triad, which functions as chord ii in E minor. Our expectation of a perfect cadence at the end of bar 23 going into bar 24 is hence subverted as we are shifted to an entirely unrelated key which results in a sense of incredulity. The latter half of Example 6 then continues modulating by conventional means, lowering the leading note of E minor from D-sharp to D-natural and returning to B minor. This example of the G-sharp minor is similar to the B minor fugue in that the expected E major chord in bar 83 as shown in Ex.8 is subverted and shifted to an E-sharp minor chord, but since it is part of an interrupted cadence, and the function of the interrupted cadence is, to interrupt or to deceive, the unexpected shift to E-sharp minor only augments that role and not diminish it. In contrast, the B minor fugue seems to be the type of music that would be considered “turgid and confused” by Johann Adolph Scheibe in his notorious criticism of Bach in 1737. Therefore, I would say that Bach had always been drawn towards extreme chromaticism; the difference in practice between the two books of WTC might not lie in how much chromaticism is used, but in what context and to what effect they are used. These episodes, with their beauty in simplicity, might actually be more memorable than the fugue subject itself, and together with the episodes from the A-flat major fugue (BWV 862/2) they are another feature that one would struggle to find comparisons in WTC 2.